"Ouch ouch ouch, it's done?!" Because of the loss of medical personnel to the Pacific War - many were drafted to serve in the Japanese military and never returned, there was a public health crisis in the post-war era. The long vanished black death and cholera actually made a comeback. 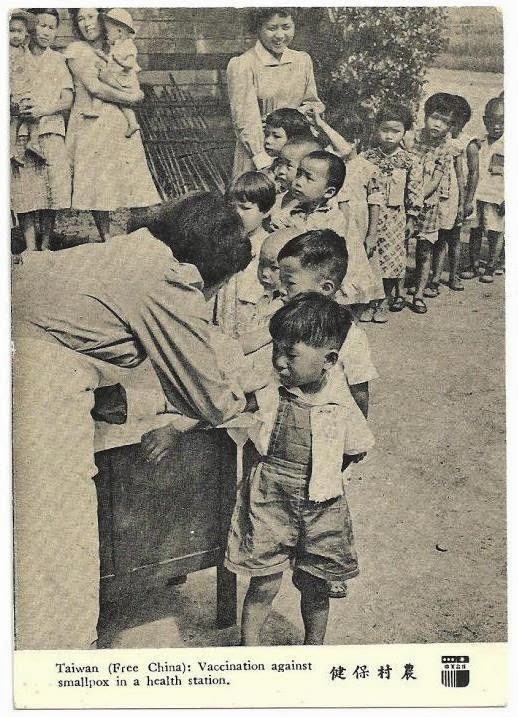 As part of the 美援US aid, vaccines such as that for diphtheria, and BCG vaccines (BCG: Bacillus Calmette-Guérin, known in Taiwan as 卡介苗) became available. 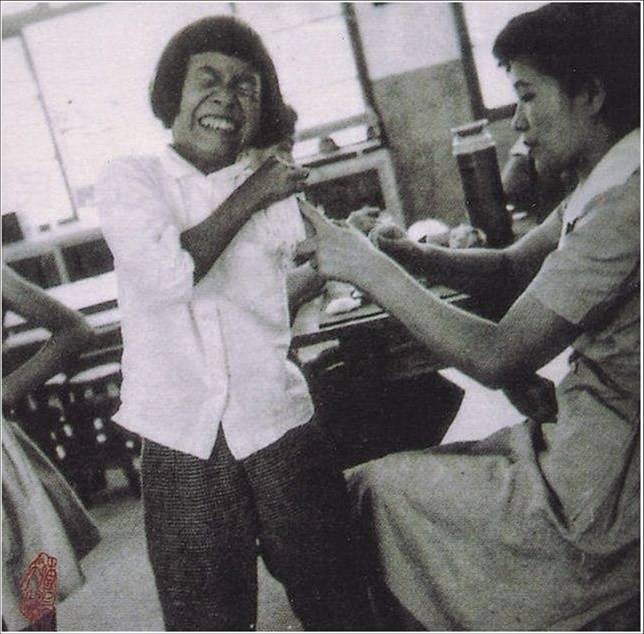 And programs such as mandatory vaccination and malaria eradication were instituted through the island-wide network of 衛生所Public Health Clinics. In Tamsui, the Clinic was headed by Dr 蔡坤煌Tsai Kun-Huang. 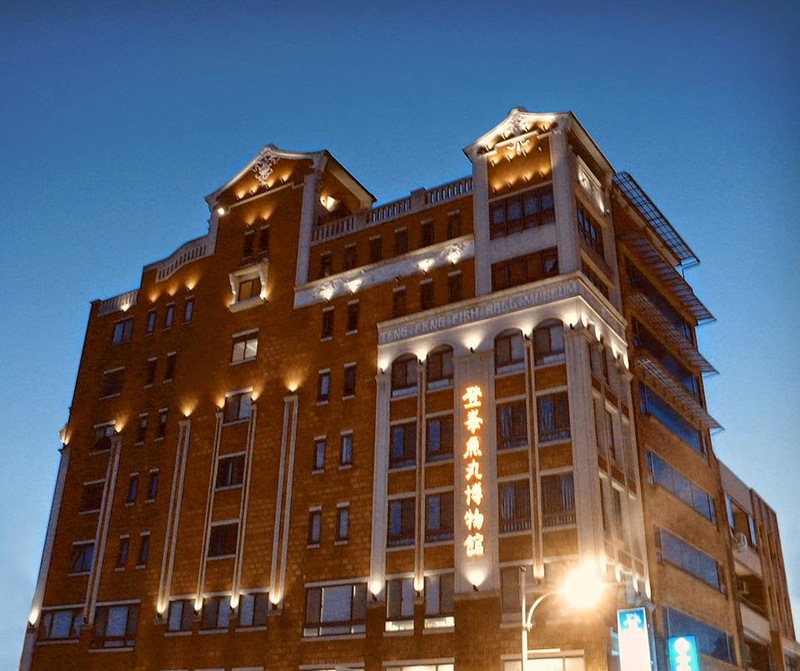 It was located next to Tamsui Elementary School with a huge front yard where a make-shift movie screen could be quickly erected and cartoons on health subjects shown in summer evenings. These cartoons were in English, so no one knew what the narratives were all about; although from the animated colorful pictures, even us kids could surmise that being bare-footed might be comfortable but bad for you, because some kind of parasitic worms could enter through between the toes and wreck havoc with your organs. Not that anybody we knew had contracted the disease whatever it was, we did love to squish an earthworm with our toes. Of course, we quickly lost interests in those black-and-white ones. It was less sophisticated in other parts of Taiwan. 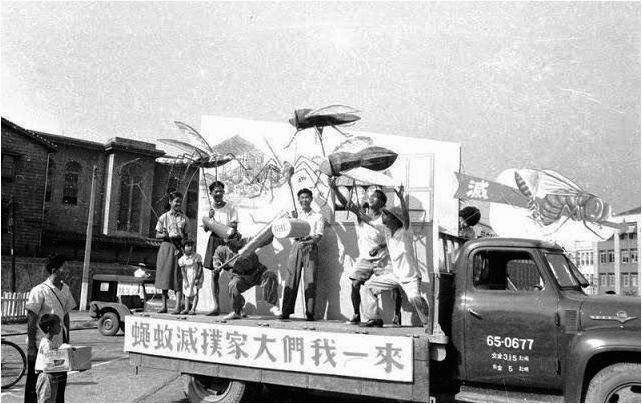 This 1957 photo shows a mobile team of actors, playacting the diseases which houseflies and mosquitoes could carry; although this was already known to the Taiwanese, not to mention the also common knowledge that the dreaded plague was carried by rats (a bounty program was actually promoted in Tamsui during the Japanese colonial era, see here). "Come -- let's all exterminate mosquitoes and flies!" The medical tradition in Taiwan did recover, slowly but surely, from the loss of physicians, and medical and immunological assistants to the Pacific War, and continues to safeguard the health of the Taiwanese to this day. Hi Marc, I see the vaccination photo and the WW2 site vintage photos, thanks.